This box helps explain the association that I always have had. I can't learn the dock. I am afraid we might need to move back to Windows. I can't stand it. I've tried explaining to myself how to minimize it into the corner and tried minimizing applications to icon, but no luck. Is there an application to display a list? I'm not looking for alternative techniques for understanding. I really needs a list, not a dock. Preferably it would work look similar to Windows Dock. Having used applications like Quicksilver before, and knowing the ingenuity and geniuses in the Mac community it feels like someone could create something like this. 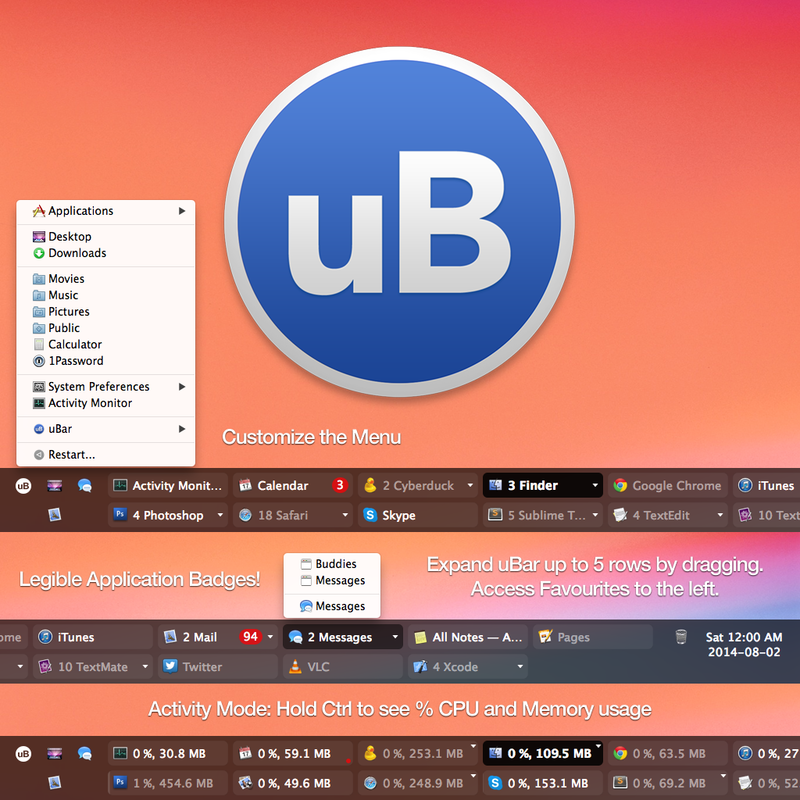 uBar is a Windows-style taskbar for OS X that I developed. Be sure to set Window Grouping to Never in the preferences, and it will exactly replicate the behaviour you are looking for. DragThing is a commercial application that can display a list of running applications. It can be configured to create a Windows-like taskbar. Download DragThing (thanks to this page for telling me about it) . It costs US $29 but you can try it for free. However, if you like it you should buy it. Open the downloaded DMG file, drag the DragThing icon to the applications folder, delete the DMG file, open the applications folder (or Launchpad if you have Mountain Lion) and open DragThing. Make sure DragThing is the active application (It says "DragThing" next to the  in the topleft corner then), press ⌘+0 and close all the DragThing windows except the one that appeared when you pressed that. Right click on the window that appeared when you pressed ⌘+0 and click Rotate. Drag it to the center of the bottom of the screen. 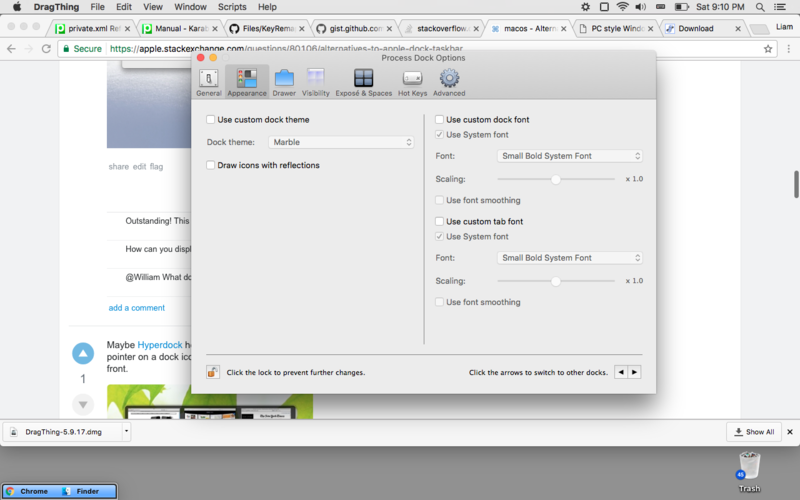 Right click again on it and click "Dock settings...". Enjoy your shiny new taskbar! Eventually right click it and select a new color. Maybe Hyperdock helps. 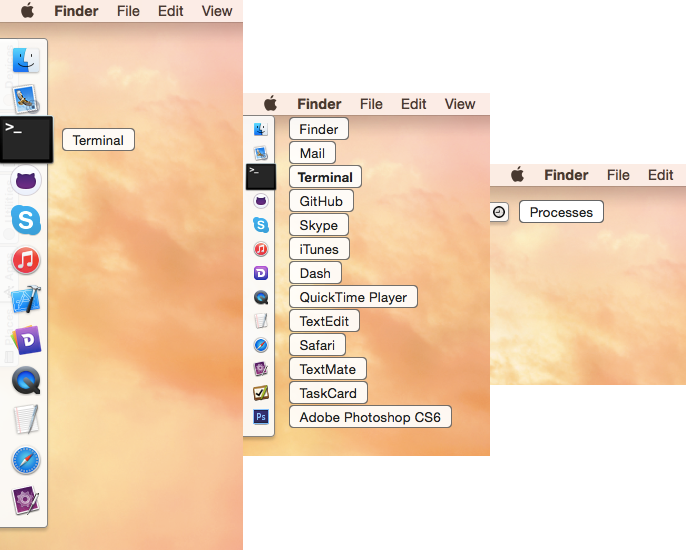 It shows thumbnails of all open program windows when resting the mouse pointer on a dock icon. One can click on a thumbnail in order to bring the respective window to the front. I cannot live without. Available from the app store. Here is some more information about DragThing, in addition to com. BOY's answer. I have owned and used this program for more than ten years. There is a free trial; the app costs US $29. You can position DragThings' Process Dock on the bottom of the screen if you want; I have it in the upper-right corner of my screen. Visually, you can choose from many different color schemes and designs. I chose the "heads-up-display" translucent black design. In the "Process Dock", clicking on one of these open application icons will immediately bring that application to the forefront. This is analogous to the bar at the bottom of the Windows desktop. DragThing is not designed to be "Windows-like". If anything, it resembles features of Mac OS 9, the "classic" MacOS. But I think it will do the trick. DragThing has myriad configuration settings that you can customize; far too many. It's daunting. But once you figure out the features and configure it the way you want, it will just work. I have used DragThing for more than ten years. I can't live without it. Having configured everything I want in two DragThing panels: a Process Dock in the upper right-hand corner of my screen; and a tabbed icon panel on the bottom of my screen, I subsequently banished Apple's Dock off the screen and I virtually never use or look at Apple's Dock anymore. Here is a review of DragThing from MacWorld Magazine from two months ago. If you can't figure out how to configure DragThing to function like you want, you can email the developer, James Tomson, for tech support. DockShelf is a general Dock replacement and can be used to add process docks to any side of the screen (shown at different sizes, styles and as a tab in the screen shot). I use Windows on and off for short periods of time and managing windows is a problem for me also so I'd recommend not minimizing windows at all but instead hiding an application (command-H) when you're not using it. 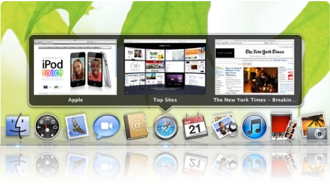 When you select another application using any of the dock methods mentioned, all the windows will appear on screen at once. In the interest of full disclosure I am the developer of DockShelf. Not the answer you're looking for? 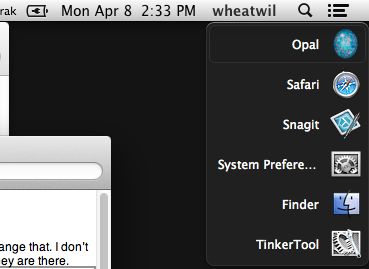 Browse other questions tagged macos dock . Is there a dock for switching between windows? What are the dimensions for the apple dock icons?